Placeholder - I'll get back to this tomorrow. I'm intrigued by this one! 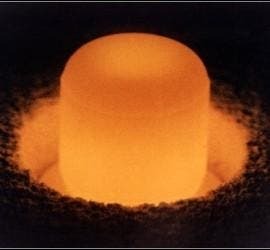 Plutonium does not exist in nature, first manufactured in 1940, for use in the fatman bomb used on Nagasaki and subsequent Bombs. Because it does no exisit in nature, the human body has no way to deal with it -consequently very toxic. As a power and heat source, Pu-238 has also been used to power instruments left on the Moon by Apollo astronauts, navigation and weather satellites, and interplanetary probes. The interplanetary probe Pioneer-10, powered by a Pu-238 source, recently left the solar system. "Dr Alfred G. Maddock Cambridge - Alfie’s scientific papers from the period in Canada [1940s]are still classified as secret, but one story has become famous. At some point the whole stock of plutonium (some 10mg) was spilt on a bench. He immediately sawed out the contaminated part of the bench, dissolved or burnt away the wood (the story varies) and managed to recover about 95% of the plutonium. His co-workers were surprised to discover a neat round hole in the bench the next morning."